Total Eyecare is your choice for optometrists in Elko offering full, state-of-the-art eyecare services. We provide eyecare for the whole family, from infants to seniors. Our goal is to accommodate your vision needs and keep your eyes healthy for years to come. 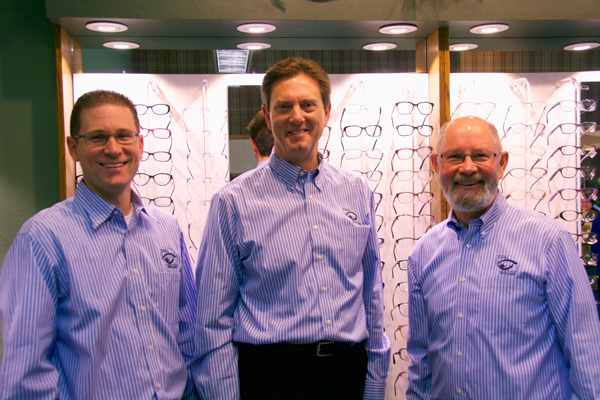 Our team of optometrists, Dr. Robert Colon, Dr. Kurt Alleman, and Dr. Colby Curtis, are experienced in the latest ocular technology and members of the Nevada Optometric Association and the American Optometric Association. Plus, we have a friendly staff who provide A+ customer service. From designer eyeglasses and sunglasses, comprehensive eye and visions exams, pre and post-operative care and treatment for disorders like glaucoma and macular degeneration, we’re your destination for eyecare services. Turn to Total Eyecare for your vision and eyecare exam. As professional optometrists, we recommend an eye exam once a year to safeguard your eyesight throughout your life. Diabetics are more at risk for eye disorders, such as glaucoma, cataracts and diabetic retinopathy. Genetics can also play a role in risk factors for eye conditions. Our eye exams are highly comprehensive and test your visual acuity, eye function and eye health. The visual acuity testing evaluates reading and distance vision and the eye function test evaluates eye tracking, peripheral vision, eye muscle capability, and more. We can also detect a broad range of retinal disorders though our Optomap Retinal Exam and our Optical Coherence Tomography (OCT) and provide treatment options for glaucoma, macular degeneration and cataracts. Today, those with myopia, hyperopia and astigmatism can say good-bye to eyeglasses and contacts with laser eye surgery. Prior to laser eye surgery, we perform advanced diagnostic testing to ensure that you are a good candidate for this procedure. Also, we provide excellent pre-and post-operative care. After surgery, we immediately schedule follow-up visits in order to monitor your progress. Looking to ditch your current eyeglasses for a trendier frame? Shop our eyeglasses boutique for a wide selection of top designer frames and sunglasses. You’ll find fashion-forward frames for round, oval, rectangular or square faces and any age. We also work with many local employers like Newmont and Barrick to provide safety glasses to their eligible employees. Also, if you prefer contacts over eyeglasses, we’ll do a comprehensive contact lens exam which evaluates the interaction of the cornea and the contact lens and determines what type of contact will best meet your visual and lifestyle needs. Whether it’s time for an eye and vision exam or you’ve experienced a change in your vision, call Total Eyecare in Elko, NV at (775) 738-8491 to schedule or schedule online. And if you’re seeking to learn more about Total Eyecare, just browse our website.